Provides an online curricular resource for pharmacy education, including over 20 online textbooks, case studies, lab tests, calculators, videos, and exam review questions. Includes practice exams for USMLE, NAPLEX, NCLEX-RN, PANCE/PANRE, Internal Medicine Certification, Pediatrics Certification, Commonly Prescribed Medications, and Generic-Brand Name Drug Review, as well as create-your-own exams from a variety of subjects. 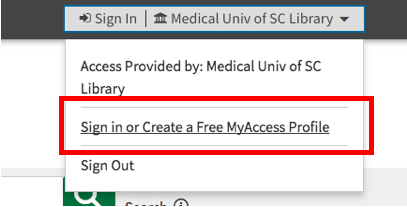 To use Exam Master, you must register with an MUSC or USC email address. Within AccessPharmacy, you will find a comprehensive review tool called NAPLEX® Central. NAPLEX® Central contains multiple review books, question banks, and review videos. To access this tool, click the “NAPLEX® Central” tab in the menu bar of the AccessPharmacy website. AccessPharmacy Description of this database. 2. Click the "Sign In" button in the top right corner of the page. 3. 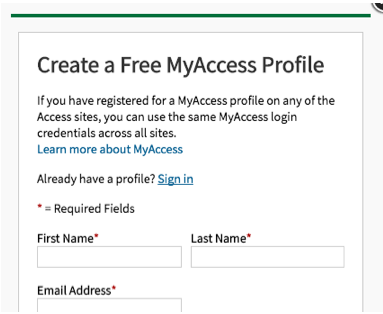 Click "Sign in or Create a Free MyAccess Profile"
5. 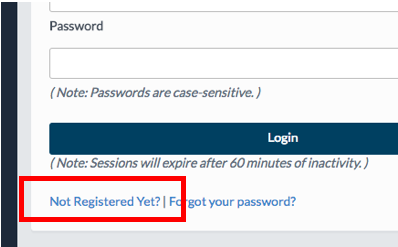 Fill out the required fields and then click the "Create Account" button. Create a free Exam Master Online account to take practice tests and review for exams! 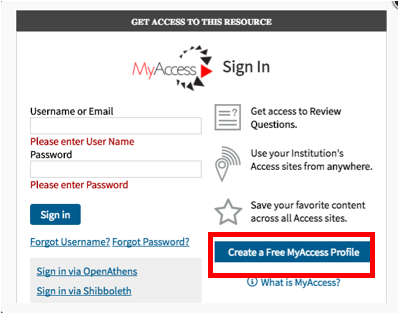 You must create an account before using this product, and you must register with your MUSC or USC email address. Exam Master Online Description of this database.